Download February's Losing Weight Motivation Material. 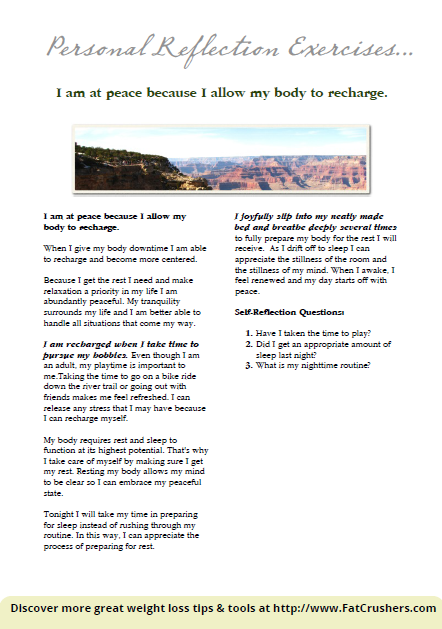 This month we have an Affirmation Reflection that you can refer to daily or as needed. Each affirmation reflection also has a short exercise as well to help you work through any challenges you may have. You can get this free gift below, but I do ask that you Share it so that it may bring inspiration to someone else. Positive affirmations are a very successful method for modifying our thoughts and changing our actions to improve our lives. But Repetition... is the key to success. If you do something often enough, it becomes a habit. But getting to the habit-stage is the hard part. I know I often start out eager and determined to make changes (I've written out my goals and made special daily declarations for myself) and then I forget about them. I recently found a way that I can achieve my personal goals easier, whether they be weight loss and fitness related or another goal I need to accomplish - still using the power of positive affirmations. Improve your life & achieve your goals even if you have tried many times before. Check it out for yourself if you want to boost your current weight loss plan and reach your goals sooner and easier. For more Motivational Content to keep you uplifted, join others who receive exclusive motivational gifts and more that you cannot find here on the blog by clicking "Get Started" below.